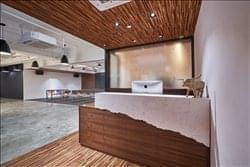 Find My Workspace lists over 95% of the serviced offices & coworking space market in Kwai Fong. Simply click Request Quote to check pricing for one office, or Add to Basket for multiple offices. This centre provides fitted offices, shared space, meeting room and seminar space. It is specially designed and integrated to, create an interactive co-working space with the core values of collaborating, organize business startups seminars and networking events and encourage creative innovation, sharing and industries cross-over for win-win collaboration. The centre provides 24-hour access, air-conditioning, beverages, breakout/lounge space, CCTV, copy and printing facilities, furnished offices, IT support, meeting room, shared internet, telecoms, telephone answering and training rooms for your daily office use. To obtain information for your selected Kwai Fong Serviced Offices & Coworking Space, please tick the "Add to basket" box for each office you prefer and complete the form below. We will then send a detailed report via email.